My Reading Club’s topic was about Geography. We shared books about weather, hazards, clouds, etc. Then, in regard to the books we shared, Ms Lo, our Geography teacher, discussed with us and clarified some ideas. Through the discussion, we learnt more interesting Geography knowledge. Moreover, I learnt how to organize a reading club by myself. Although my presentation was not really excellent, it was really a great experience for me. 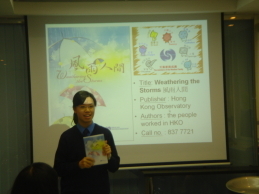 Ms Cheong was happy to see four or five other participants had also read relevant books and shared enthusiastically with Powerpoint. The event was a success – It’s what reading to learn is all about. I think I can do better next time.